Kasutera is a sponge cake made of sugar, flour, eggs, and starch syrup. It is a speciality of Nagasaki Japan, but the cake is originally from Spain. The name is believed to derive from a region called Castilla. During the 16th century, a Portuguese ship came into Nagasaki, which used to be the port of Japanese commerce. The Portuguese brought the Japanese many unusual things such as guns, tobacco, and pumpkins. Kasutera was also one of the things they brought. Kasutera was able to be preserved for a long period of time so it was necessary for the sailors who were out on the sea for months. In the Edo era, it was a sweet that was precious and was served for the envoys from Korea. Later, Japanese people started making kasutera, and the cake's taste slowly changed to fit to the Japanese palate. This is the root of the kasutera in today's Japan. Kasutera is made of natural ingredients, so its simple taste is a favorite of many Japanese people. There are now many kinds of kasutera, made with various ingredients. For example, there are kasuteras made with powdered green tea, cocoa, and also brown sugar. 1. Preheat oven to 325 degrees F (160 C). Use parchment to line the bottom of a 10-inch tube pan, preferably with a removable bottom or 2 (8 x 4-inch) loaf pans. Grease the parchment. In a large bowl, whisk 1 cup sugar, honey, vanilla, lemon extract, and salt into egg yolks. Place bowl in a large pan of hot water. With an electric mixer, beat about 5 minutes on medium-high speed until pale yellow and doubled in volume. Gently fold in sifted flour. 2. Wash beaters. In a large bowl, beat egg whites in electric mixer on a low speed 1 minute, increasing speed to medium-high. When foamy, sprinkle in 1 tablespoon sugar and cream of tartar. Beat until stiff but not dry. With a spatula, fold the egg whites in thirds. Pour batter into pan. Tap gently on the counter to remove air bubbles. 3. Bake on middle rack of oven 35 to 45 minutes or until golden brown. When done, cake sides will pull away from pan slightly; top will be flat and feel spongy when pressed with finger. Cool 20 minutes. Run a small knife between edge of cake and pan. Remove from pan carefully. Pull off parchment and cool completely. Serve or store airtight. Makes 12-24 servings depending on which size cake pan you use. This recipe is adapted from the Kastutera recipe in "Japanese Cooking for the American Table" by Susan Fuller Slack. It is a wonderful cookbook, with recipes that are interesting and *very* authentic. If you like Japanese food, check it out. We are doing a civics progect for school, and we also did a green tea ice-cream to go with it. We turned it in and A+! Thanks! It tasted great too! I am doing this as a school report and I think it will get me an A+ so I automaticly love it!!!!! I tried this recipe last year for "food day" in my Japanese class, and it was absolutely delicious! Thanks so much for the recipe. I and my friend like it a lot. I first doubted because of its lack of butter or fat. Now I like it even more because of this. hello! i'm from argentina and your recipe has literally saved my life!! i've been looking for it for a long time, but nobody knew how this delicious cake was made until now. where did you get this valuable information? I loved the cake but I also had a thick layer form at the bottom of my cake. What did I do wrong? The top part was delicious. Sponge cake turns into an omelet when there's not enough air beaten into the batter. Your batter had some air in it, but not enough for it to rise. The trick is to beat the yolks and egg whites for the time specified in the recipe. Make sure to use a large rubber spatula or spoon to fold the whites into the yolks. Also sift the flour through a sieve when adding it to the yolk batter. It helps to mix the yolks with a whisk before adding the whites. It'll make folding easier since the ingredients didn't settle down. Exceptional taste. I cooked it in a bain marie and it was moist and light at the same time. Great recipe, very easy to follow and the result was extremely delicious! I tried making it 2 days ago, and today I tried a different castella recipe from another website and yours is still the best!!!! Thank you for sharing! YOU DIDN'T TELL US HOW LONG IT WOULD TAKE TO BAKE IT! well it looks like a good cake but i'm retarded. can anyone explain to me where the sifted flours suppose to be when i put the other ingredients in and is there any substitutes for cream of tartar? I had been looking for this recipe for several days!!! THANK YOU!!! This is great even though I have never made a sponge cake before. Does the cake usually not rise because one seemed to come out pretty flat (I used bread loaf pans). I couldn't find a green tea powder even though I would have loved to use that. It tastes great but can anyone tell me why the cake sinks in the middle? I was disappointed that this doesn't taste like traditional kasutera. Kastera should be more dense and the overwhelming flavor should be buttery even though butter wouldn't be one of the ingredients. This recipe does produce a nice spongy and lemony cake, but I definitely would not call it Kasutera. Dean, you can substitute an acid for the cream of tartar, like lemon juice. That's what I used since I rarely have cream of tartar on hand. Delicious recipe, though nothing like authentic Kasutera. I tweaked the recipe and it came out great. I reduced the sugar by a 1/4 and used all purpose flour instead of cake flour. If your cake sinks in the middle, I think you need to bake it longer. I baked mine in two loaf pans for about 55 min. If you touch it and it's not firm it's not done. I have the same problem whereby my cake sinks in the middle but it first came out beautifully from the oven. Can anyone tell me where i went wrong? I tried chocolate instead of lemon extract and the chocolate flavour didn't come out as rich as i've expected. I have thought of adding cocoa powder but seeing that when mixed with egg yolks, it becomes pretty dry. What can i do to improve the flavour without altering the texture of the cake? My friends and i made this for our school culture festival and everyone loves it! We had printed recipies for people to take so they could try it at home and many people did take a recipie with them. We had sample sizes for people to try and there was none left after just an hour! Its amazing, thanx for the great recipie! My first time baking. Recipe is great! Thank you soooo MUCH!! !although it does not come out like the traditional Kasutera Cake. It tastes more like a lemon sponge cake. I will tweak it there eventually. However, my cake sunk in the middle after awhile...why? it is so ugly! how can i perfect its beauty? I want it to look like the square-ish looking Kasutera Cake that i buy from markets, any help? Sounds simple enough, I'm going to try it for my daughter's class for International Week next Friday. I was really looking forward to baking this cake for a friend who absolutely loves Japanese sponge cake(the commercial kind), however, I am a baker and I thought I followed everything just as the recipe stated, and I even baked until the cakes pulled away from sides of loaf pan but my cakes fell, really bad in the middle and looks really bad now. What could have happened? I'm sure I whipped the egg whites and yolks enough. Any input is appreciated. I LOVE THIS CAKE. ITS AWESOME AND WHEN I TRAVEL OVERSEAS THIS IS ALL I CRAVE FOR!!!!!!! Im doing this for a school project!! It looks great and I bet it will taste great! I'm getting and A+!! Thanks. Thanks for the recipe! This is the first time I successfully baked a cake! I thought it wouldn't turn out very well after I folded the cocoa powder and flour into the yolk mixture since it didn't seem airy at all. But the cake turned out wonderfully. I'm going to make this cake again. Is this recipe VERY sweet? Step 2 is unclear. At what point do the contents of the large bowl in step 1 get combined with the contents of the other large bowl in step 2? And what on earth does "fold egg whites in thirds" mean? Sorry, I'm a beginner baker. The recipe is almost the same with chiffon cake except for the honey. That's why it is moist. If your cake sinks in the middle..did you use "cake flour"? All purpose flour has more gluten that's why your cake will sink in the middle unlike cake/pastry flour has less gluten content. Also the egg whites when you beat it should be stiff..make sure too not to over mix it when you add the flour mixture. Is it also possible to have this recipe with grams? These American cup measures are just too weird and not precise. It tasted ok, but didn't have the flavor of a high-quality castella cake. The texture was nowhere near as refined as I had wished for - but that could have been me. It produces a soft, fluffy and tender sponge cake, while slightly too sweet, had a delicious and slight honey flavour with a sticky and crunchy top. I would definitely make it again, but lessen the amount of sugar. Best eaten the day it's made though, it loses the initial cloud-like fluffiness with each day that passes. Thanks! The recipe is great! I made this for my friend and we both loved it. It was ok and it sunk in the middle but I think that's because I used all purpose flour, such a shame. Thank you for an absolutely superb recipe. I tried another recipe 3 times determined to succeed - but every cake was a failure, until today. I was determined to find the perfect kasutera cake recipe and I did. I made this for my physics class, but I only got a B-. How was I supposed to know the hot water bath broke Newton's 2nd law of motion? LAME. OMG, I love this recipe. It is the most awesome recipe ever. P.S. It also helped me for my Japanese booklet at school and I am 14. Bye. best Becipe EVER!!!!!!!!!!!!!!!!!!! We made this for a Japanese unit for school. It is om nom nom good! I recommend it. I appreciate you sharing this blog. Really thank you! Very informative article. Much thanks again. Keep writing. Just made this cake and it is amazing! It tastes just like the ones we used to eat when we were little. THANK YOU so much for this recipe. Appreciate you sharing, great blog. Thanks Again. Much obliged. This is one awesome blog post. Much thanks again. Fantastic. It looks so yummy but i cant make it because i don't have lemon extract. A big thank you for your article post. Much thanks again. Fantastic. I appreciate you sharing this blog post. Really looking forward to read more. Fantastic. The cake tasted great, but I felt it was a bit dry. I think maybe I shouldn't have added the cocoa powder. I will definitely try this again but with the lemon extract next time. 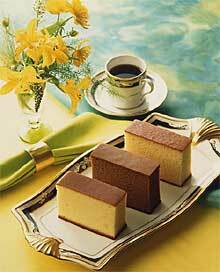 The texture of the cake doesn't really resemble the texture of a japanese castella. It is just a very soft and light sponge, which is good if u want something light.